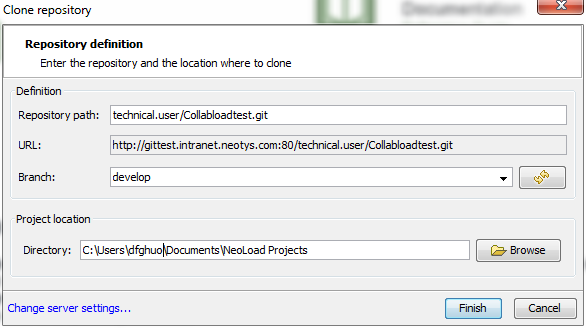 NeoLoad 6.2 makes it possible to collaborate on test projects using a GIT collaboration server. For more information about configuring the connection to a GIT server, see Configure the connection to a collaboration server. Once the connection to the GIT server is configured in NeoLoad 6.2, the collaborative project can be retrieved from the server by using the Clone Repository command accessible via the Share menu. Warning: The Clone Repository command is only accessible when the GIT protocol is selected in the Collaboration Preferences section. Warning: The project name can only contain letters, digits or underscore. Any punctuation characters, space or dash are not allowed. Warning: Before cloning a repository, it must be created on the GIT server of your choice. A repository must be created for each new collaboration project. The Repository path field must be filled in with the path to the repository shared on the GIT server. The path entered in this field must end with “.git” to be valid. Info: When the path is already stored into your clipboard, Neoload automatically fills in the field. The URL field displays the URL to the project shared on the GIT server. It matches the information entered in the Collaboration Preferences menu. The Branch field can be filled in with the branch to be checked out after cloning the repository. The field can also be populated with the tag or commit id to check out. Information: For versions prior to NeoLoad 6.8, the "develop" branch was used for the collaboration on a GIT server. The refresh button allows retrieving the branches available on the repository and choosing the one to check out. The directory where the Neoload project is stored locally can be changed by clicking the Browse button. In the Repository path field, enter the path to the repository shared on the GIT server previously configured. In the Branch field, enter the name of the GIT branch to check out. Click the Browse button if you want to modify your NeoLoad local directory. Click the Finish button to retrieve the project. NeoLoad makes it possible to checkout a branch from a GIT server. Information: To checkout a branch from a GIT collaboration server, NeoLoad must be configured to connect to a GIT server as described in Configure the connection to a collaboration server. The Checkout command is accessible in the Share menu. Branch: The field can be populated with the name of a branch, tag or commit ID. A click on the refresh button allows retrieving the branches or tags available on the server. A click on the Checkout button validates the checkout.